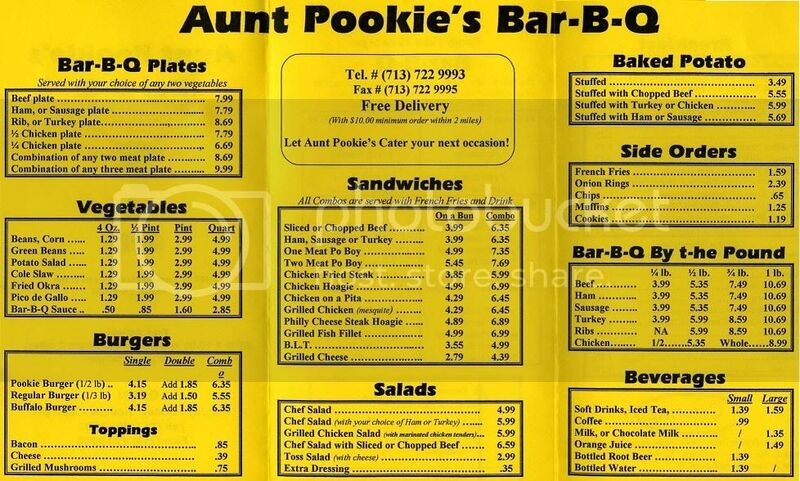 Even though I had driven past Aunt Pookie's located on Beltway 8 West probably 100 times, I never knew it was there. It is located in an industrial park. 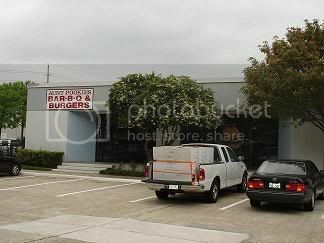 As I walked in the door, I was a little worried that maybe Aunt Pookie's was more of a BBQ place than a burger joint. I was proved wrong after having a bite of my Aunt Pookie's cheeseburger. I'm seriously thinking about doing a napkin test to demonstrate the oooze factor of a burger. If I had administered that test on the Pookie's Cheeseburger, it no doubt would have scored fairly well. I can imagine about 50% of the napkin would be see through from the oooze. It didn't rank up there with the oooziest burgers I have had, but it was definitely not a dry burger. 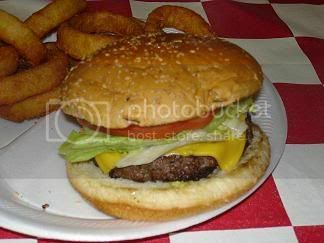 The Pookie's Cheeseburger was a 1/2 lb burger. Now I have learned from the many burger joint experiences that when a place says it is a 1/2 pound burger that could mean one of 2 things. Either the burger was 1/2 lb before it was cooked or it is a 1/2 lb burger after it was cooked. I'd have to say the Pookie's is a 1/2 lb before cooking. It certainly was not a huge button buster burger, but it definitely filled me up. Not many herds died for this bad boy though. 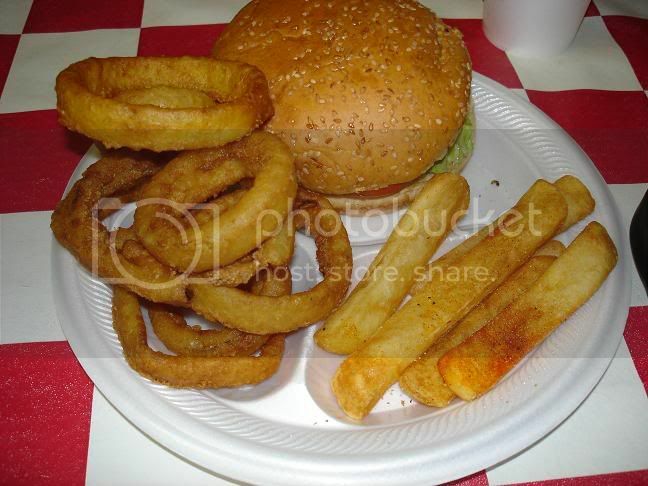 Pookie's has a nifty little buffet that you can dress up your own burger. Here, you can pile the lettuce, tomato, and whatever else you want on your burger as high as you want. 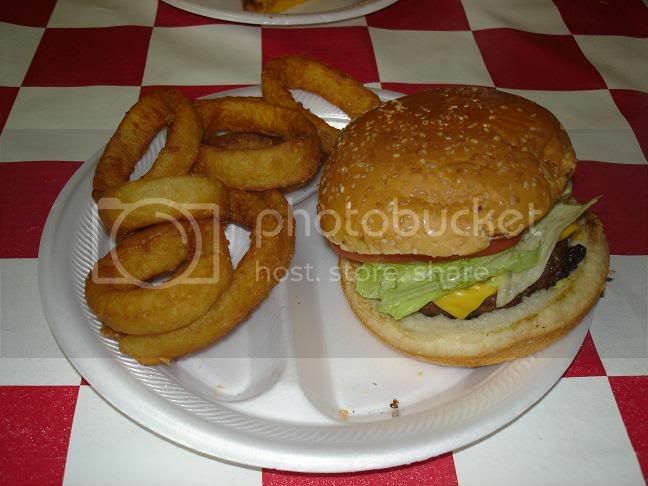 The pictures you see show my burger after it was dressed by me. It was probably a 1 1/2 hander burger. If I had gone crazy with the vegetables or if the patty was a 1/2 lb after cooking - it would easily be a 2 hander. As it is though - this is a 1/2 hander. The Pookie's 1/2 lb Cheeseburger is 4.15. All in all - it isn't that bad for what you get. The burger had very good flavor. Backyard burger flavor is probably the easiest way to describe it. If you like a good flavored burger. The 1/2 lb Pookie's Cheeseburger is a pretty good deal. 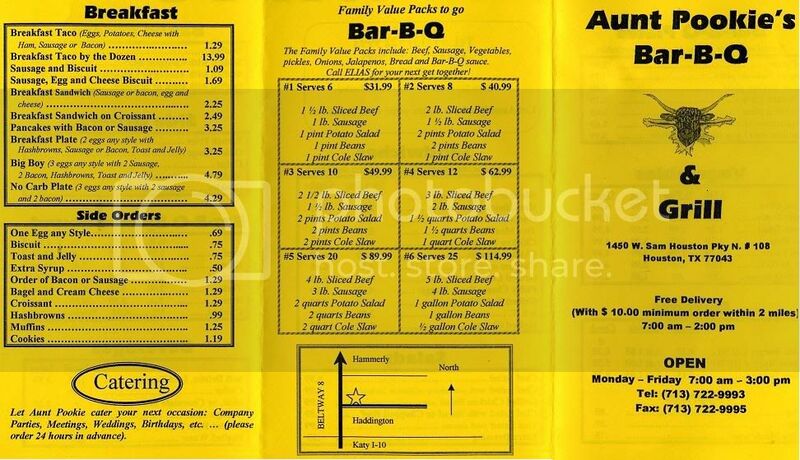 The Pookie's menu is pretty heavily slanted towards their BBQ. You can get a variety of BBQ plates including ham, turkey, sausage, ribs, or beef. I can tell you the smell from the BBQ may have just made me want to go back for a taste of the BBQ. The reviews I have read about the BBQ have been favorable. I tried the onion rings and the fries. Do yourself a favor and order some onion rings. OH MAN are they good??? They are the greasy, soft variety. When you take a bite, the onion is pretty slimy. I love em that way... some people don't including Mrs. TBG. Mrs. TBG had the grilled chicken sandwich that they grilled with mesquite. It was awesome! All in all we didn't have anything that stood out as being bad. Pretty much everything we tried was good. Aunt Pookie's has a great little patio out front. (can't see it from my picture) The inside is pretty standard - nothing special. It doesn't have the atmosphere of a Mel's or anything like that. Aunt Pookie's is a standard restaurant type place... that's it. The waitstaff was very polite. Very good visit to Aunt Pookie's. I think one day we will be back to try the BBQ. From I-10 and Beltway 8 (Sam Houston Tollway), go north on the access road. About 1/2 mile on your right, you will see the Aunt Pookie's sign (see top of review). Aunt Pookie's was a great place. It is more of a BBQ place, but they also have a mean burger. While it wasn't the best of the best, it definitely held its own. The flavor is what stayed with me... it was very good. If you are in the area and want to try a good tasting burger - give Pookie's a run - oh and get some onion rings... you will be glad you did!!! I pass this place on the way to work every morning. I always thought it was a little dive and never bothered to try it out. Will give it a try now. Great blog! Accurate description...However, my burger was at least 1/2 pound when delivered. You should try out Joe's Mesquite Grill just a few minutes away from Aunt Pookie's. Its on West Little York off of the Beltway. Okay, can I say 'Yum!" I work around the corner from them and we eat there often. I have not had a bad meal yet. They have excellent Breakfast Tacos and a wide variety of breakfast items. The BBQ is good and so are the burgers. The staff is great to deal with. 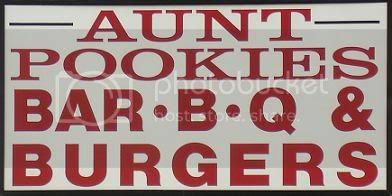 The only thing wrong with Aunt Pookies in my book is that I find it hard to enjoy my BBQ without a Frosty Adult beverage. Wondering if this is one in the same Aunt Pookie's that use to be on Richmond inside the loop by the Richmond Chill? 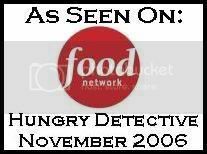 We use to eat there many many moons ago, she had a fantastic order of fries back then. For some reason I have a waffle design, or more of a wedge actually that comes to mind! aMy order; a chopped beef sandwich, potato salad and drink came to $ 8.22. The bun was hard, the beef was sparse and the soda was flat. The potato salad, however, is almost as good as my own. I ate a Pookie burger today based off of this review and it was aweful. I actually saw the cook take a pre-cooked patty out of a metal container and put it back on the grill to murder it some more. It was charred, dry and had a burnt flavor. McDonalds has juicier burgers. There was not enough condiments in the world to make this burger taste good. The onion rings were good, however.